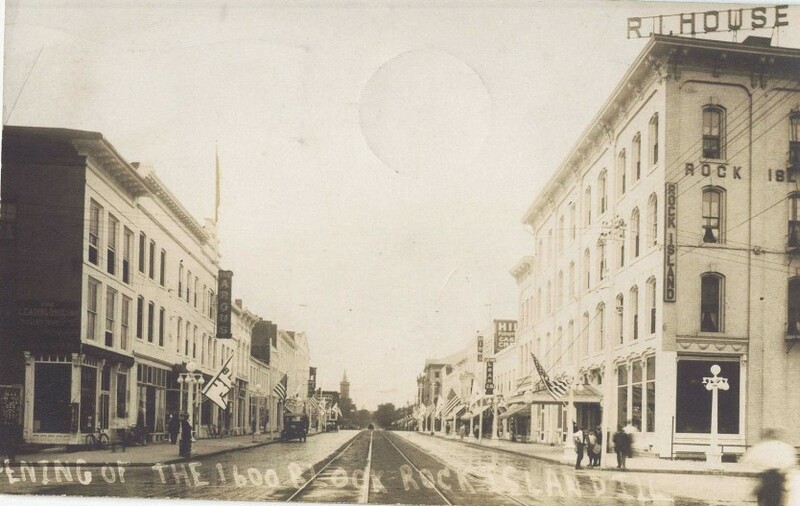 This Real Photo postcard from Shannon Hall’s collection is postmarked 1914 and captioned “Opening of the 1600 block, Rock Island, Illinois.” The prominent “R I House” sign atop the building at the left reveals that the camera is looking west on Second Avenue with the Rock Island House hotel and 17th Street in the foreground. Other sights include The Argus building, with a hanging sign midblock on the left, and, in the distance, a partial view of the courthouse dome. The steeple of St. Joseph’s church is prominent even from several blocks away. The “opening” mentioned on the card may be honoring new paving, a new streetcar line, or even the installation of fancy streetlights which did not exist a decade earlier. This is a snapshot in time that encourages speculation. The pavement is wet and reflective, implying recent rain. The many flags may mean an imminent celebration, even a parade. Only two autos are in sight, although another can be glimpsed in the distance moving down the avenue. Three bicycles stand by the Argus building. Perhaps they belong to the three boys at the right, who could be newsboys waiting for the latest edition. Otherwise few pedestrians are to be seen. Blurry images indicate that they are moving too quickly for the camera to capture. The history of the Rock Island House hotel closely parallel that of the city itself. Rock Island County was officially established in 1833 with Stephenson, as the city of Rock Island was then known, named the county seat. As the first courthouse was being built in 1836, Captain Henry Powars decided that this new town also needed a hotel. For the structural timbers, oak trees were felled on the bluffs near Port Byron in the winter of ‘36 and floated downriver after the spring thaw. Other raw materials and finished lumber had to come upriver from St. Louis and elsewhere. Yet only eight weeks after starting construction, on July 4, 1837, the new hotel was ready. In 1854, a four-story frame building, with an “L” on the alley, was erected, probably using the older two-story hotel as its base. It covered an area 100 x 150 feet. This “ill-shaped caravansary” was at least partly demolished and totally rebuilt in the Italianate style in 1875 under owner Isaac Negus, who had purchased the hotel in 1865. In this era, “new” construction often occurred over and around an existing downtown structure. An 1888 drawing depicts the hotel as having a narrow balcony with an ornamental cast iron balustrade at the second story level all across Second Avenue and wrapping around the corner on 17th Street. By 1905, the second floor dining room was remodeled to create a fine ballroom. The postcard shows Negus’ building as it appeared some thirty years after construction. Although not visible here, other photos of the era confirm the hotel has a hipped roof with numerous chimneys for stoves or fireplaces. Carved brackets trim the area under the eaves. The window frames have a gentle curve, called a segmented arch, and hold sashes with two panels of glass each. Fancy brickwork divides the street façades into panels. The Second Avenue side is not symmetrically divided (count the windows in each panel) probably because the old brick part of the hotel is contained in the far left (west) part of the new structure. The tall first story windows on the storefronts are framed by what appear to be cast iron columns. The delicate entrance portico supported by chains is not original but was added sometime after 1903, as were the signs on the rooftop and at the corner. Although the upper stories were hotel rooms, the ground floor held a variety of businesses, including saloons, cafés, and billiards halls, that appealed to both travelers and local folks. The hotel era ended in the early 1920s when Hill Furniture Company (notice its sign a few buildings to the left on the postcard) announced a $90,000 plan to convert the Rock Island House into a store. Sears Roebuck followed in the 1930s. Later retailers included Younkers, Mosenfelders, and Hyman’s Furniture. During an early retail remodeling, the former attic area was expanded into a full floor and the facades were modernized with the wide “Chicago style” windows that remain today. Although those windows had been covered for many years, the exterior was restored a few years ago when the upper stories were remodeled into apartments. It was also renamed the Ann Goldman Building in honor of Stanley Goldman’s wife. Although it looks quite different from the old Rock Island House hotel, some of whose structure still lies beneath it, this restored structure, still has a greater than fifty-year-old appearance to maintain its historic presence downtown. This article, by Diane Oestreich, is slightly modified from the original that appeared in the Rock Island Argus and Moline Dispatch on June 20, 2004.